Who has time for boring? These recipes and living life in a megalopolis are anything but! Lentils with Mustard-Herb Butter -Another 5 star! I’ve had this recipe for months and months and months. I put it in my meal planner, buy the ingredients and when it comes time to make it, I don’t. I think it seemed intimidating. The original recipe included salmon and had the French translation at the end of the title. I think that’s why it was intimidating. I like to cook, but I’m no chef, and I certainly don’t consider myself sophisticated enough to make French food! So in an effort to clean out our freezer I decided to just do it! The night I made this, my husband took a nap and I just took a deep breath and with great determination, entered the kitchen. I read the directions a couple of times and decided to make the lentils first (cause anyone can boil some legumes, right?). Then I made the mustard butter. Then I chopped the leeks and it all just fell into place entirely WAY too easily. Before I knew it, dinner was ready, I woke my husband up and he said “already? How’d you do that so fast?” and that’s when I realized I’d actually finally conquered this oh-so-intimidating recipe and did it like I was a professional! As it turns out, French food isn’t intimidating, it’s just all about the butter! When we sat down at the table, I took another deep breath and tasted the lentils. HOLY COW! They were packed with this amazing flavor! My husband and daughter loved them too! It was definitely a 5 star recipe. The next day I even ate the lentils cold, that’s how good they were! These were so good I thought I’d just post the lentil part of the recipe so that it could be a vegetarian dish (hey! It’s Meatless Monday after all). The salmon was good, but that’s not what made this recipe worthy of 5 stars. However, I’ll post how to cook the salmon at the very end so that if you do want to have this recipe as originally written, you can. Cook lentils: Bring lentils, water, and 3/4 teaspoon salt to a boil in a heavy medium saucepan, then reduce heat and simmer, uncovered, until lentils are just tender, 20 to 25 minutes. Remove from heat and let stand 5 minutes. Reserve 1/2 cup cooking liquid, then drain lentils. Make mustard-herb butter: Stir together all ingredients with 1/4 teaspoon each of salt and pepper. While lentils cook, chop leeks, then wash . Cook leeks in butter in a heavy medium skillet over medium-low heat, stirring occasionally, until softened, 6 to 8 minutes. Add lentils with reserved cooking liquid to leeks along with 3 tablespoons mustard-herb butter and cook, stirring, until lentils are heated through and butter is melted. Add lemon juice and salt and pepper to taste. Remove from heat and keep warm, covered. Sauté salmon while leeks cook: Pat salmon dry and sprinkle with 1/2 teaspoon salt and 1/4 teaspoon pepper (total). Heat butter in a large nonstick skillet over medium-high heat until foam subsides, then sauté salmon, turning once, until golden and just cooked through, 6 to 8 minutes total. 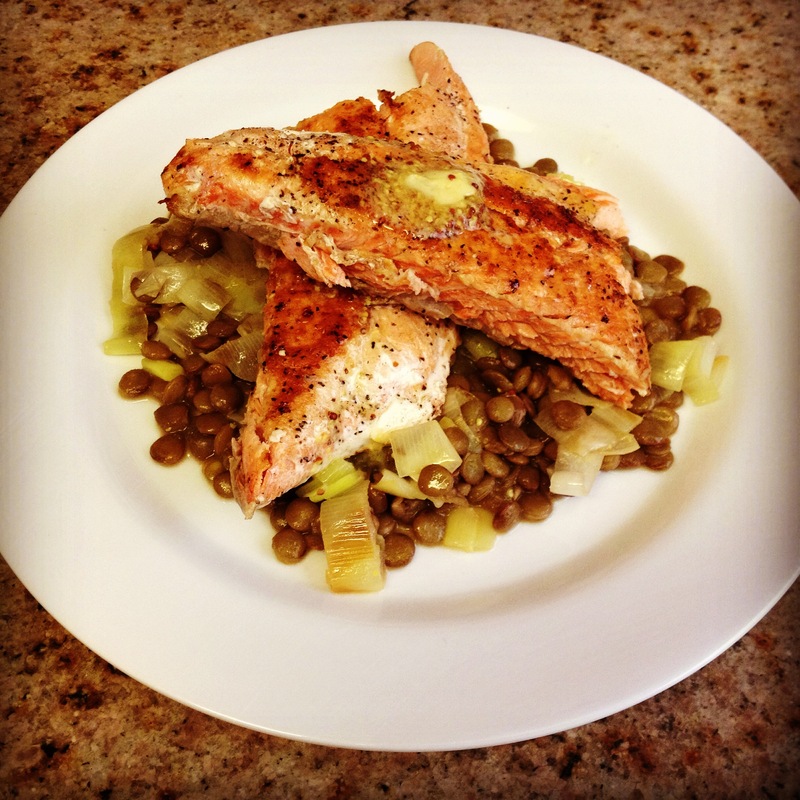 Serve salmon, topped with remaining mustard-herb butter, over lentils. Happy Saturday Morning! Cinnamon Bun Scones- 5 Stars! On a quest to find 30 darn good five star recipes!